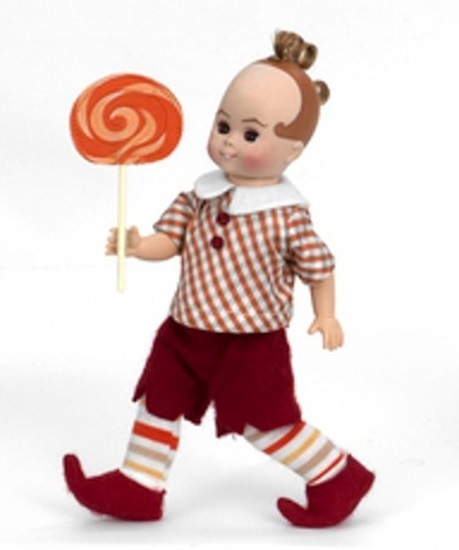 From Madame Alexander's Wizard of Oz series we are pleased to share with you Orange Lollipop Munchkin, an 8-inch bent-knee Maggie face doll with brown eyes and stylized tosca hair. He is wearing a red and white and blue gingham shirt with a white collar and white buttons, red felt shorts, and orange and white striped leggings with red felt pointy "elf" shoes. An orange and yellow swirled screen printed lollipop completes this ensemble.